Sperm whales carry the largest and one of the most complicated biological sound generators in the animal kingdom. Their sound generating nose can reach a weight of more than 10 tonnes and generate the highest sound pressures ever measured from any animal with back calculated source sound pressure levels of 230 dB re. 1uPa (rms). Some man-made underwater sound generators can generate equally high or higher sound pressures. Examples of such man-made sound sources include explosive charges, airguns used in seismic exploration and sonars. This log will outline why comparison between different biological and man-made sound sources should be made with caution. It may be argued that an animal cannot be harmed by sound pressure levels that it itself is capable of producing. Hence, if this line of reasoning is pursued, a sperm whale that can produce source sound pressure levels of 230 dB re. 1uPa should therefore not be harmed if exposed to a sound pressure of 230 dB re. 1uPa from a man-made noise source. That is not correct. Anyone who has been exposed to an excited drill sergeant will appreciate that sound pressure levels from a conspecific can indeed be unpleasant and damaging to ones hearing. Secondly, toothed whales have special sound production systems in their foreheads that are designed to project a highly directional sound beam forward of the animal and away from their ears - i.e. the whales ears are not receiving a sound pressure that equals the source level of its sound production system. In addition, many animals have build-in hearing protection, so when they know that they are going to make a loud sound, they reduce the sensitivity of their ears by contraction muscles that stiffens the small middle-ear bones that transmits sound energy to the inner ear. One of the man-made sources of underwater sound that has received much recent attention in possible conjunction with recent strandings of beaked whales (Frantzis, 1997; Jepson et al., 2003), is the mid-frequency, anti submarine warfare sonars (ASWs). This type of sonar is designed to produce powerful sound pulses to be used for active localization of hostile submarines at long ranges. Mid-frequency ASWs produce very high source levels of 230 dB re. 1uPa (rms), and such source levels are often quoted in conjunction with the possible deleterious effects of this device. The 230 dB re. 1uPa should not be compared to the high sound pressure levels in air from say an jet plane, but it is nevertheless a very high sound pressure that is generated (please refer to previous log). It can be been argued that a mid-frequency ASW cannot be more harmful to marine mammals than a sperm whale producing equally high source sound pressure levels. It is, however, not fair to compare those two sound sources per se, as there are a number of factors that should be taken into consideration. Marine mammals perceives and are affected by the energy in a sound pulse as well as the instantaneous sound pressure. Because sperm whale clicks are very short (0.0001 of a second) compared to the mid-frequency ASW sound pulses with durations of often more than 1 second, the sonar pulse will contain 10000 times (40 dB) more energy than the sperm whale sound pulse, if both are measured from the same distance and in the cone of the sound beam. So while the pressures of the two sound pulses are the same, the energies differ by four orders of magnitude. 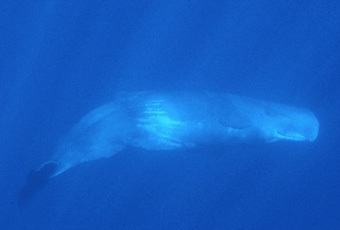 A second factor is that the sperm whale emits its powerful clicks in a very narrow beam, so the part of the water column that is ensonified by high sound pressures is considerably smaller than that of the mid-frequency ASW sonar that emits its sound pulses in a broader beam in a horizontal layer around it. In addition, the ASW sound pulses will propagate further in the ocean, because the low frequency sounds at 3-8 kHz propagate with little attenuation compared to sperm whale clicks at 15-20 kHz. It is important to note that one should discern between a source level (the sound pressure measured or back calculated to a 1 meter range from the source on the acoustic axis) and a received level. In open oceanic water, the sound energy will propagate away from the source as a pressure wave of an expanding sphere, which means that for every doubling of range to the sound source, the sound pressure will be halved. That means that very few if any whales will be exposed to the 230 dB re. 1uPa (rms) that is the source level of the sonar. If the whales are 10 meters away from the source, the received sound pressure level will be reduced by a factor of ten to 210 dB re. 1uPa (rms) (see previous log on how decibels scale) and the received level will be reduced by another factor of 10 at 100 meters to a received level of 190 dB re 1uPa (rms). If this simple so-called inverse square law of spherical spreading applies, it is also evident that the volume of water ensonified by a given sound pressure will depend critically on the source level. Consequently, if the source sound pressure of a sound source is reduced by a factor of two (6 dB), the volume of water ensonified by a given sound pressure will be reduced by up to a factor 8 if spherical spreading is occurring. Unfortunately that is seldom the case, but it is nevertheless true that even relatively small reductions in source level will lead to ensonification with a given high sound pressure of a much smaller body of water. No matter if one argues for or against possible effects of man made noise, it is important to realize how sound is quantified by humans and sensed by animals, and appreciate that comparisons between sound sources should be advanced with caution and with due respect to relevant units of sound magnitude. Read the recent Odyssey log - Navy Sonars and Whales. This VOICE FROM THE SEA was written by Dr. Peter Madsen. Dr. Madsen is a bioacoustician at the Wood's Hole Oceanographic Institution and a former chief scientist aboard the Ocean Alliance whale research vessel Odyssey.